No need to book - just turn up and bag a spot in the marquee. We are delighted to welcome a host of fabulous local cooks to our chef demo stage in 2019 who will share their skills throughout the weekend. Among them are Phil Fanning from the fabled fine-dining establishment Paris House in Woburn and Val Stones, loveable star of The Great British Bake Off. Val stole the nation's hearts with her ready smile and Yorkshire charm on the hit TV series and showed her quirky side by dancing around the Bake Off while her creations were cooking! The chef demos take place hourly and are free. All the chefs wear microphones and the demonstrations are shown on large TV screens so you can see everything close up. The chefs concentrate on using fresh, locally-sourced, seasonal produce to prepare their signature dishes. Simply pull up a chair and enjoy! Phil Fanning is the award winning Executive Chef and owner at Paris House, a fabled restaurant set in 22 acres of parkland on the Duke of Bedford's estate in Woburn. Phil is considered to be one of the brightest culinary talents in the country, with Paris House featuring in the Hardens’ Top 100 Restaurants for 2019. Phil began cooking at an early age and his gastronomic passion was fuelled further when he featured as a finalist on the BBC’s Junior Masterchef as a young teenager in 1997. A glittering career has followed and in 2014, Phil bought Paris House and has just celebrated five years at the helm, establishing it as one of the top fine-dining restaurants in the UK. Phil will bring a touch of his Paris House flair to the chef demo stage. Bake Off star and author of The Cake Whisperer! 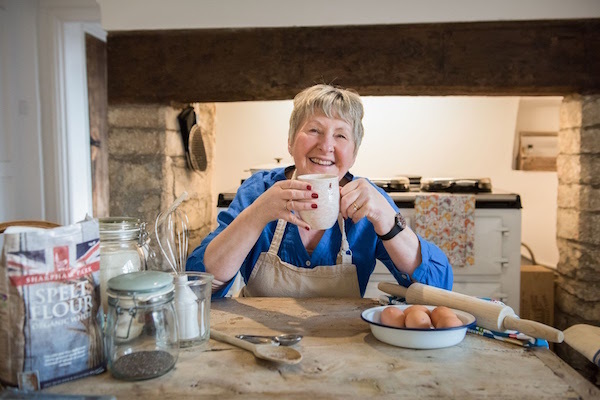 Val Stones burst into the national consciousness in 2016 when she appeared on the seventh series of The Great British Bake Off, stealing everyone’s hearts as one of the most lovable – and quirky – contestants the show has ever had. With her infectious smile and warm Yorkshire accent, to the delight of Mel and Sue, the former primary school headteacher danced around the Bake Off tent while her creations were cooking and wowed Paul Hollywood by winning the fiendish dampfnudel technical challenge. Like many Bake Off contestants, Val’s life has changed since the show. She has just written a new cookbook, The Cake Whisperer!, which is so-called as Val professes to be able to tell if a cake is cooked by pressing an ear close and listening to it. Originally from Doncaster, Val starting baking at the age of 15 and has spent 50 years in the kitchen, delighting various members of her family along the way. She now lives near Yeovil in Somerset with her husband Ian. Carmela is Northampton’s Queen of Italian cuisine. Carmela grew up at the apron strings of her Italian mother and grandmother, and is an evangelist for traditional Italian cooking. A mother of four, she is recognised as a pastaia (a specialist pasta maker) and is the author of three cookery books - 'Southern Italian Family Cooking', ‘A Passion of Pasta’ and 'Northern and Central Italian Family Cooking'. Carmela's mantra is to cook simple, inexpensive, flavoursome food with good quality seasonal ingredients, in keeping with the ‘Cucina Povera’ cooking style of the Italian south, which she teaches in her classes and workshops. Carmela has recently launched a range of frozen, ready-made meals which are exclusively available from the Italian shop in Northampton, where Carmela hosts her regular sell-out supper clubs. Justin has been creating wonderful food for 25 years, learning his craft at 'The Wentworth Hotel' in Aldeburgh before moving on to manage a very successful and popular gastro pub in the county for 10 years, before opening his own establishment at 'The Red Lion' in the lovely village of Culworth in 2009. Between them, Justin and his wife Bronni, have developed a substantial loyal following of diners who enjoy his keenly priced contemporary style food, sourced locally wherever possible and always with attention to freshness and seasonality. Seafood is a great favourite at The Red Lion and daily deliveries from Brixham provide plenty of inspiration for the specials board alongside the regular mouthwatering menu. Justin will be cooking Thai fish balls, made with fresh South Coast fish, in a red Thai curry sauce with cardamon and coriander rice and flatbread, part of the Red Lion's new summer menu. Justin’s keen interest in food extends to keeping his own pigs and chickens, and picking up inspiring ideas from his travels abroad. It’s not all about food though as playing golf and following Formula One racing play a big part of his life too! James Peck learnt his trade in the Army before leaving at the age of 21 to hone his skills in high-end London kitchens. He returned to his native Northampton when he was headhunted as a head chef. In 2018, he set up his own niche catering business in Northamptonshire – Burnt Lemon Catering – which provides fine dining for parties, high profile events and weddings. He has just finished filming a new reality TV show hosted by Michelin-star chef Jason Atherton, called The Brigade which will air on prime time TV soon. It follows a team of ten hand picked chefs around the world as they cook against some of the best restaurants on the planet. Turan is the creative force behind the Coldsmoking Cookery School in Great Linford. He has been smoking and preserving foods for many years and is now sought out for his knowledge and experience. He featured on Nadiya's British Food Adventure on the BBC where he spent a day teaching Bake Off winner Nadiya the art of cold smoking fish and also worked with Jamie Oliver's Fifteen apprentices in London teaching them how to smoke food. 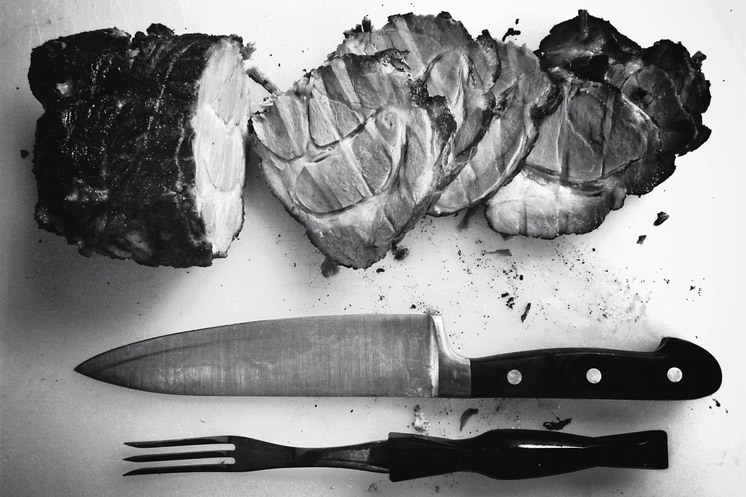 Turan has written books on food smoking and hosts bespoke food smoking courses and meat curing and charcuterie courses at his cookery school, along with a host a variety of other artisan food courses. Turan will be demonstrating the preparation, curing and hot smoking of a fresh salmon side accompanied with sweet dill pickled cucumber ribbons and a wholegrain mustard mayonnaise.